Serre Chevalier is a vast ski resort, made up of a string of villages winding along the bottom of an alpine valley, around which is about 250kms worth of excitingly varied skiing terrain. Beautiful as well as varied, Serre Chevalier is also one of the few big French ski grounds built around characterful old villages. So the apres-ski is as varied as the skiing. The accommodation runs the full gamut too and the best places to stay in Serre Chevalier range from apartments and chalets to traditional auberges and modern hotels. Serre Chevalier isn't the most glamourous French resort, or the most fashionable, but it's becoming ever more so, and it's a great place to be if your ski trips are all about skiing (or snowboarding). The 250kms of runs are interconnected, so you get a sense of travelling when you ski, especially as you're tunnelling through one of the long, quiet woodland runs. But that's not to say that there's nothing here but beautiful skiing terrain. As well as the main villages of Le Monêtier, Villeneuve and Chantemerle in which you'll find most of the best places to stay in Serre Chevalier, there are nine other little villages or hamlets in the region, and all of them are a pretty warren of cobbled streets around old centres. Most of them feel very French, with their old cafes and hotels and cosy bars. The more modern hotels sit outside the towns. At the extreme south-eastern end of the valley is Briançon, which is France's highest town - a 17th Century fortified one at that. The fortified centre, with its patisseries, cafes and auberges, is a World Heritage Site. And everywhere you'll find friendly locals. It's worth mentioning snowboarding again, as Serre Chevalier is said to be like one huge fun park, with lots of long runs and a big drop which you may have seen in snow boarding videos, if you're into that sort of thing! Le Monêtier is the smallest, quietest and prettiest of Serre Chevalier's main villages. It's the least spoiled, as its more modern architecture is much more in the style of the charming old village. 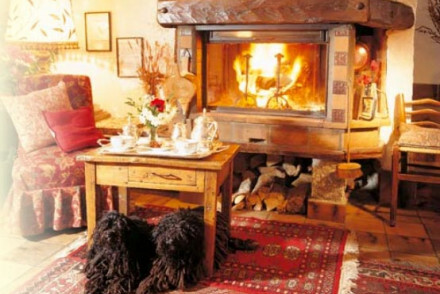 And right in the heart of Le Monêtier is the Auberge du Choucas, a charmingly cosy 12 room auberge within minutes from the slopes, and the thermal baths. As well as being the perfect spot for folks who like to enjoy their winter sports in peaceful surroundings, this is one of the best places to stay in Serre Chevalier for foodies - there's a gastronomic restaurant on site known for its fresh, local produce. Still not sure where to book? Browse through our list of all the best places to stay in Serre Chevalier, or contact, one of our friendly gurus for advice.